At Moss Roofing Oxford we are experts in the design, supply & installation of new roofs for your home. Whether you need a roof for your new house or a replacement of your existing roof, we are here to help. We have a dedicated team of highly skilled team of roofers who can provide you with an aesthetically appealing new roof that is guaranteed to last for many years to come. We are able to install a wide range of new roofs for your home from rubber roofs, fibreglass roofs, tiled and slate roofs. All of our new roofs are installed by fully qualified roofers who will also make sure that your new roof can withstand all weather conditions and doesn't lose excessive amounts of heat through the roof during winter and stays cooler during hot summer months. GET A FREE QUOTE ON A NEW ROOF! If you would like to arrange a free on site consultation with a member of our team then please feel free to get in touch with a member of Moss Roofing Oxford today to discuss your requirements. We will arrange a convent time to pop out and provide you with a free quote for the project. We will also provide you with any advice, along with answering any questions that you may have regarding your new roof. 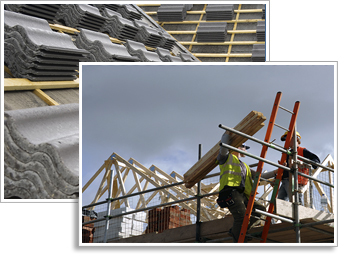 We offer a wide range of high quality residential roofing services.